and then giving her treats to teach her. Her size is also as a result of her previous owners. People who knew them tell us that her previous owners didn't buy cat food and would just feed her whatever was in the house. As a result she would eat anything she could get her paws on. 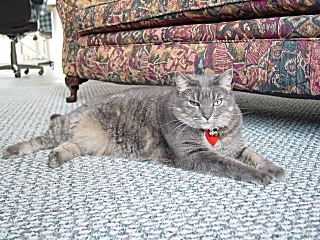 Note: Miss Lila passed away quietly of natural causes in her sleep on Christmas Morning, 2003. She is missed by many friends and mostly by Miss Madison.